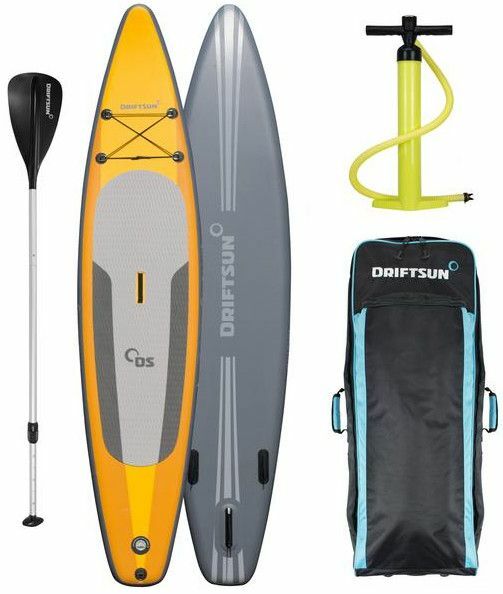 This is not the first inflatable standup paddle board made by Driftsun that we review on this website, and it won’t be the last either; because simply this company keeps on doing a great job taking care of the quality of their products and their customers’ satisfaction. As the title suggests; this iSUP is a racing board, but I’d like to mention that Driftsun has a large list of choices for different riders with different needs. You’ll find for example the Explorer which is great for touring and recreational paddling. But since you’re here, I’ll just confidently assume that you’re into an upgrade in need for speed; thus, the Driftsun 11’8″ Racing iSUP is your boy. Racing boards are known for their length; the Driftsun Racing is 11.8 which is absolutely huge. 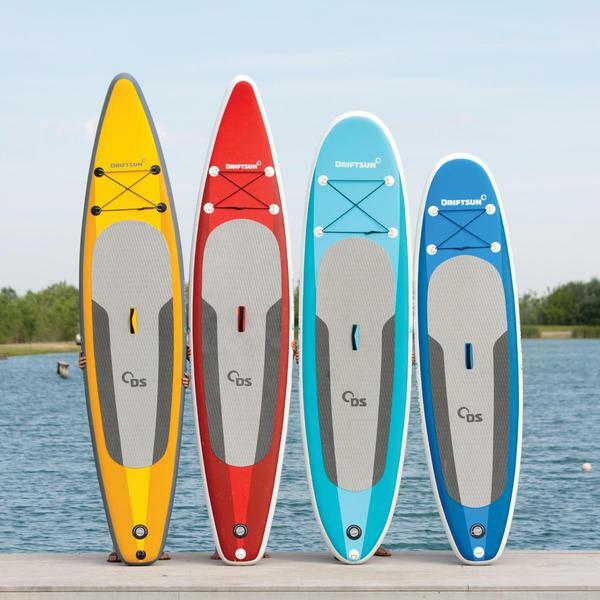 The pointy nose is what makes these iSUPs quite special; it allows the board to knife through the water smoothly and swiftly. This paddle board can take up to 300 lbs and with that much space, any rider will find comfort once on board. As for width, this board is 31 inches wide which is actually great! It’ll be very easy to balance yourself on top of it, and even a beginner can pick up how to do that in no time. Those 31 inches are basically the best on the market. Last but not least, the thickness of an iSUP makes a lot of difference when it comes to durability and performance. 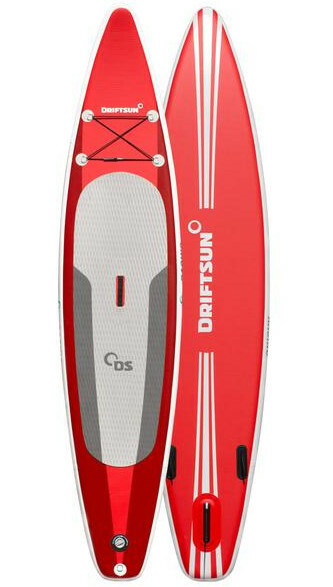 This Driftsun 11’8″ racing iSUP is 6 inches thick which will do perfectly keeping your feet off water and prevent the board from bending at the center. 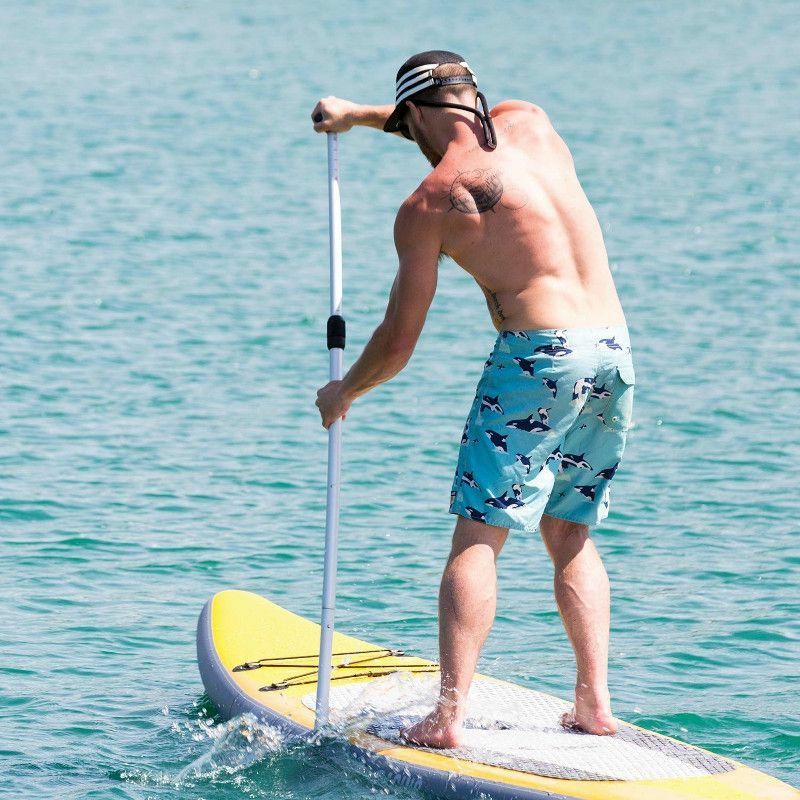 Standup paddle boarding has its charm that convinces different people to go for it as a water sport; Inflatable paddle boards that are extremely portable, functional, and suitable for all different family members and water activities. Thus, all quality companies choose the best construction material to build their iSUPs. The Driftsun 11’8” Racing iSUP is made of extremely tricky army grade PVC material that allows the board to go fully stiff and hard once inflated. This material is also meant to last years of use without losing shape. The drop stitch technology as well contributes to making any board a sturdy one that feels like one whole piece. The Drifsun Racing looks and feels pretty neat with a high end definition and a 1 year warranty coverage. A large EVA traction pad that covers what’s half the board’s back; it’s very soft and grippy making standing or sitting on it very comfortable. A central carry handle that makes carrying the nearly 12 feet long iSUP an easy task; it’s rigid and rubbery for maximum comfort and functionality. A bungee system that consists of 4 D-rings connected with a bungee cord for you to secure needed item to the board. A 5th D-rings is on the board’s tail to attach a safety leash if needed. A navigation system with 3 fins; 2 are lateral and fixed while the last one is large and removable for easy transportation. Those fins do a great job in different water conditions making the board stable and fast. A deluxe travel bag with backpack straps and rolling wheels that serve its purpose perfectly and effortlessly. A dual action high pressure. A lightweight collapsible aluminum paddle. The best thing honestly and which many good iSUPs lack is the amazing backpack; you can easily pack, store and transport the whole package. The hydrodynamic 11.8 feet Racing iSUP is built for speed and efficiency over long distance rides. The pointy nose makes slicing through calm or choppy water a pleasing experience especially with the shape and design that result in a superior stability, maneuverability and speed. Designed for riders with intermediate to advanced skills, this board could be a great upgrade for a beginner who’s ready to learn new tricks and ride a bigger board with more potentials and possibilities. The Driftsun Racing comes in an all-inclusive package with a great backpack. It’s featured with everything that makes standup paddle boarding a water sport to go for. Its sleek design and pointy nose make it great for long distance rides. The navigation system makes it a very versatile board that can take on different water conditions. Even though it’s a racing iSUP, the stability on this one is pretty impressive with a 31 inches width. It’s always the pump that could be a better one with such packages; however, ordering a large iSUP like this one, you should be prepared to make some effort to pump it unless you want to use an electric pump.